Rated 5 out of 5 by MrsBen from EXCELLENT GAME QUALITY, GRAPHICS AND EERIENESS! I am really enjoying this game and stopped only long enough to purchase it! Domini Devs should be really proud of this one!! I love the mood of it and the way the puzzles are presented. Some are very unique and very well done. I've just begun what I know is going to be a splendid and unusual adventure!! Rated 5 out of 5 by mmdgaston from WINNER!!!!!!!!!!!!!!!!!!!!!! told myself i was not going to like this one, as the other 2-3 from this series have been awful........imagine my shock!!!!!! good game...graphics are beautiful.....a storyline!!!!!!! some of the puzzles were new and different....some old school....no matter..this was and is a good game.......imagine that???!!!!!!! Rated 5 out of 5 by rainworm from Movie time? A horror festival! We have to track down Maya and her colleagues in an old cinema, where they were last seen. She is an architect and renovating the old horror movie cinema is her latest project. Her last call to her brother was suspicious, he heard strange noises and saw ghostly figures in the background. Since then, she and her team are vanished. As these are no normal circumstances and the usual police investigation is useless, he asks us for help, as our specialty is the paranormal activity ! The cinema has of course a history: here the famous director of horror movies, Sebastian Fleming has made his films, pressing the last out of his actors to achieve the highest quality. His goal was bringing the real feelings on the reel, showing real fear, not just acting. Rumors will have it, he was mad and drove his crew half crazy as well. During the shooting of his last film ‘The Night of Evil’ he came to death. Police reported it as accident, though it remained suspicious. The fake equipment for the horror scenes had turned out to be real, so he was electrocuted. Maya and her team must have revived his ghost when they entered the building and started their work. The ghostly Sebastian Fleming seems to go on, where he was forced to stop, by directing the ‘Night of Evil’, now with the newly arrived ‘actors.’ The series about the paranormal detective has been modernized: no special glasses but a smartphone will help us, see behind things, detect the paranormal. We use it, discover one or more items and a HO scene is triggered, in which we learn more about the background of the current situation. As always, plot is enfolding fast with a lot of challenging puzzles and creative HOS - and the fantastic story about the horror movie director is thrilling enough. 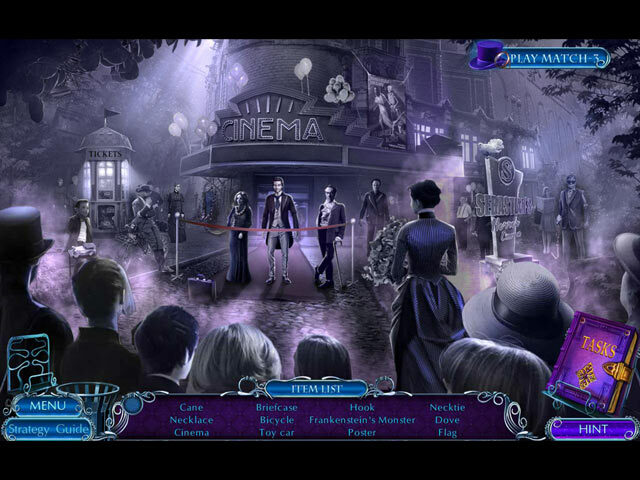 Rated 5 out of 5 by biscuitsmama from LIGHTS, CAMERA, ACTION – LET THE FUN BEGIN In a trip to the cinema and a retrospective look at “B” rated horror film genre from past years, Domini brings us the tenth game in the Mystery Tales series – The Reel Horror. Detective, meet Sebastian Fleming a director obsessed with creating a true horror film but one who is having trouble pulling the essence of fear from his actors. Never fulfilling his dream of creating the perfect horror film before his death, Sebastian’s ghost is now haunting the old theater where his films were shown. Your services have been requested by Police Investigator Harold Jefferson whose sister Maya disappeared while completing an architectural survey of the old theater. The theater was thoroughly searched with no sight of Maya and her team to be found. During the search Harold thought he could hear Maya calling him and he even saw a few ghosts but his colleagues laughed it off so Inspector Jefferson knew you were the right person to call for help. Will you be able to help Harold find his sister before it is too late? Although I love the gameplay, length and extras found in Domini games, I am so tired of their fantasy color palette that saturates their games in unrealistic deep purples, blues and pinks. I was hopeful that this game would be different but unfortunately, various tones and shades of purple still drench most scenes. However, in spite of my dislike of the color palette, The Reel Horror is excellent and well-worth playing. If more developers would provide the quality gameplay, HOPs, puzzles, and the LENGTH that Domini provides in their games I am sure more gamers would be willing to pay full price for games from these other devs – just saying – hint, hint! I know I sound like a broken record but HOPA games are so much shorter now and the CEs have so few extras that it should be no surprise that most gamers will wait until there is a sale to purchase them. Since I am sure others will provide all the nitty, gritty details of the game and because I believe that discovery is much more fun, I will only tell you what I like, now that you know what I don’t like about the game. Even though scary films and games have never been my thing I was taken in by the satirical look at the horror film genre of this game. There are many humorous moments and witty dialog to be found as we meet Sebastian and his victims as we play through the game. The HOPs are well-crafted and very interactive with most of them having some mini-games included as we search the scenes. There is one HOP scene that I actually thought was a puzzle until the light blinked on for me. Although I love the list type HOPs the most there is variety included with some silhouette and storybook types as well. If you don’t want to search for items, you can always switch to the match 3 option instead. 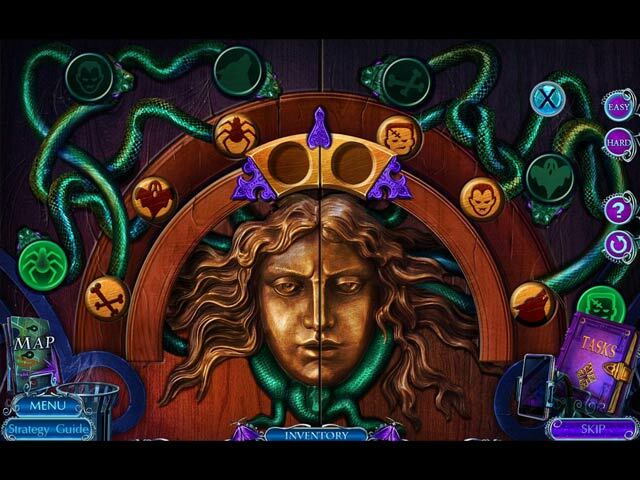 The Puzzles in the game are terrific and Domini provides the ability to choose either Easy, or Hard for most games. If you select the Custom Setting at the beginning of the game, there is an option included there for Easy or Hard puzzles. If you find the Hard setting a bit too difficult with the puzzles you can reset them and then select the Easy setting before trying again. If you happen to prefer the CE version of a game The Reel Horror is full of extras that most developers no longer provide. I am not going to describe what can be found in the extras since discovery is more fun. IMHO, this is a terrific CE value particularly given today’s sale. 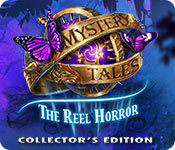 Mystery Tales The Reel Horror surprised me because I loved playing the game. I’m still not finished but have no doubt that the Bonus Chapter will be as good as the main story. IMHO, this is one of the best and most enjoyable games I have played this year. I’ve enjoyed the HOPS as well as the Puzzles and hate to admit that I have had very little sleep as I stayed up most of the night playing the game. Even though I find this and excellent and entertaining game, as always, please try the demo to see if this is a game you will enjoy. Happy gaming! Rated 5 out of 5 by sunnyglow from A GAME CAPTURING THE “REEL” FEAR IN MOVIE MAKING – A CRAZED DIRECTOR! – ONE OF THE BEST GAMES OF THE YEAR! REVIEW BASED UPON COMPLETION OF THE ENTIRE MAIN GAME 8 Chapters plus a Bonus Chapter – Strategy Guide: 66 Pages OVERVIEW: Detective! You are off to the movies. As a paranormal detective, you have been called in to investigate some ghostly activity at an abandoned movie theater. While restoring this theater, Sebastian’s Horror Cinema, an architect and her crew disappeared, believed to be the caused by a ghostly presence. Meet the crazed, arrogant ghost of Sebastian Fleming, a director consumed with the passion of capturing the true expression of fear on film. However, his methods of capturing that emotion are unconventional. Unable to fulfill his desire to create a realistic horror story in life, he now wants to create “reel” fear to bring himself back to life. Stop him before he completes his “final” film and creates more victims from his madness. OPINION: This is an academy award winning performance in gaming! If there were only one game I could purchase this year – this would be it! This is a long game, well worth the full price for this game. It should appeal to those who love mildly scary fare with a little satirical humor. There is some witty tongue-in-cheek humor throughout the game. You will receive humorous messages on your phone – a little corny perhaps, but I found some of them rather witty as well. Clicking on the scenes will produce some unexpected movement within the scenes. This is a puzzle-lover’s dream game. However, the HOP scenes are creatively designed as well. Domini is my favorite developer and they always provide more game for the money. The games are longer with extras that most developers do not provide. My only criticism would be the excessive amount of purple within this game. It truly is a case of purple overload. MECHANICS: There are four levels of play which include a customized version. You have the choice to play a female or male character. There are thirty-three (33) achievements. You can set the difficulty of the puzzles within the menu between “easy” and “hard.” You can also change the difficultly as you play the puzzles. Instead of the gimmicky pair of glasses from previous games in the series (which broke), you now use a smartphone to see paranormal activity. Collect fifteen (15) cinema attributes, eleven (11) movie posters and fifty-six (56) tickets. The tickets are exchanged for items to place in an Auditorium Hall. There are moths on the inventory bar to indicate when there is a collectible within a scene. I found most easy to locate. There are ten (10) wallpapers plus casual art along with music and video sequences. You can replay eighteen (18) puzzles and nineteen (19) HOP scenes. BONUS CHAPTER: It is a sequel. After receiving a disk containing movies from Sebastian Fleming, Shelley, the wife of one of the game’s characters, seems possessed – obsessed with watching these movies. What horror is Sebastian planning? I have not completed the bonus chapter due to the length of this game. However, it appears to be a long chapter- well-worth the extra money for the additional chapter. HOP SCENES: There are fourteen (14) in the main game. I have no idea how many are in the bonus chapter. Most of the scenes include lists of items and silhouette scenes, some within a storybook format. The scenes are interactive, and many contain mini-puzzles within the scenes. There are three I found creatively designed. One is a spot-the-differences scene. Another is a rather unsettling one with a creepy doll who chants before you locate silhouette items. I found that one a little chilling! My favorite is one in which you must use sliders along the sides of the scene to align silhouettes of the items with the actual items before you can remove them. PUZZLES: There are thirty-nine (39) puzzles JUST in the MAIN GAME! Most puzzles have the option to be played in either an “easy” or “hard mode. They vary in style and there are some truly amazing puzzles within this game. There are some new puzzles I have not seen in other games. However, I do regret Domini did not provide a replay for more of their puzzles. I believe you can replay all the HOP scenes but less than half the puzzles. SPOILERS: THESE ARE SOME OF MY FAVORITE PUZZLES AFTER THE DEMO: A. Sequence puzzle. Remove interconnected shopping carts one-at-a time in the proper sequence until all are removed. You must clear them in a specific order to remove all chains binding them. B. Connection puzzle. Create a path between a power source and two lights. Place connectors on a grid so that the ends connect to a plus and a minus. Lights will light up when placed correctly. You have seen this puzzle in other games. The directions are better written in this game. C. Gear puzzle. Rotate four intermeshing grooved gears so that the openings within the gears match up with wires. Moving ones affects the others. D. Strategy puzzle. Place marbles on a moving, winding path in a grid so they match with a given alignment. As the marbles move down the path, they change direction and realign. E. Maze puzzle. Move colored chains on a grid to their proper location. F. Connection puzzle. On a chemistry chart, start at the top and create a path turning all cells blue without retracing your steps. There are only a certain number of moves to do this. G. Sequence puzzle. Follow the directions. A new puzzle not seen before. On a grid, move a test tube using directional arrows to pick up medicine in a specific order. If you do not pick them up in order, you must restart. The test tube will keep moving until it hits one of the items or is stopped at an edge of the grid. H. Connection puzzle. Move a submarine on a grid connecting all checkpoints on the grid. Choose the correct arrow which will maneuver it through the path. Unique puzzle not seen before. Rated 4 out of 5 by GoneFishin86 from Getting Better I feel like this series is finally going in a new direction. Ever since hangman this series has been a stalled one trick pony but this game explores some new options especially a new kind of story line. The game play is still on the rudimentary side but the new direction kept my interest. In short if they stay on this path the next game should catch the spirit of the older installments. Keep up the good work domini games. Rated 4 out of 5 by Granny_Gruff from So Much Good Stuff Wrapped in Over the Top Color and Fuzz! Officer Jefferson has called for your help. His sister, Maya, has disappeared with her coworkers in an old theater she was helping to convert into a Mall. The good officer was the single person to notice ghosts in the theater while searching for the missing group. He feels you are the only one who will believe him and find his sister. Good stuff: A good story with good puzzles and a variety of HOPs. Several collectibles and assorted CE bling round out a fine new game in the Mystery Tales series. Bad stuff: Why the over-the-top color? Add to that the other on-going complaint for this series, fuzz outs between scenes and at odd times. I can't give the five stars I would have liked to award when this is the same grievance in previous games in the series. Bottom line: The crazy director, killing off his actors for authentic emotions on screen is a nice plot point for a game set in a decaying theater. It was refreshing to play a game that was not so much of a copycat. And the various items that unexpectedly moved and talked were added creepy when paired with the maniacal director. Try the demo before you buy. I hope you enjoy this new MT game as much as I did! Rated 4 out of 5 by dancemom1 from I finally get a Smartphone! Hello friends! As usual, I review mostly on the game play and leave the story line to others. We have another addition to this very long series. As usual, the graphics are excellent, even though we still have the slight blur when going in and out of close ups. Colors started out really nice, but quickly turned to this developer's usual blues and purples. Very over powering and tiring on the eyes. Voices were age and character appropriate, but I noticed we are using British currency, so why don't any of our characters have an accent? We don't have a lot of interaction with the characters in the demo, so hopefully that picks up as the game progresses. You can click through some of the dialog, if you read faster than they speak and not really miss any clues or helpful items that the character may pass on to you. Animation is well done and smooth. I was disappointed in that we don't have much in the way of sound FX, other than a quiet wind and some music as background noise. We finally got rid of those ugly glasses that we needed to use to see past events. We have been upgraded to a smartphone! This time, we get to converse with ghosts through the phone. Sure, why not, they can do everything else, right? Some ghost voices are a bit hard to understand, e.g. too deep, run words together, etc., but for the most part, they are well done. HOPs were nothing new or exciting. We had interactive lists, finding pieces of an item and highlighted words. If you don't care for the HOPs, you can switch to the match 3 game. Puzzles were very simple and took no time or brain power to complete. You can switch between easy and hard, but still no real challenge, and nothing new. Yes, we still have the perfect map, with areas easily identified and it also shows which areas have a collectible that was missed. Hint system is very helpful and opens up to the map to show you where you need to go next. Collectibles are well done and not as easy to find as you may think. We have to find 56 theater tickets that are easy to see, but also easy to overlook. We also have 12 posters that are quite large. Then there are the 15 cinema related collectible items. These can be anything and some are a little small. Even with the awful colors and the blur, I like this series. This story is a little creepy, mostly because of the "bad guy," but I didn't have anything jumping out at me during the demo. It is really nothing new and at times moves rather slowly and becomes a little boring because of it. Hopefully it picks up...usually this series does. The phone tossing out messages now and then was quite annoying and not at all necessary to the story or game play. This addition is not at all challenging or difficult, but I like the collectibles and for some reason, I have the need to play it out and see what this guy is up to and why, as long as I can get past the colors. I think most players will find something entertaining about this game and I believe it is worth the CE price. Yes, I am adding this to my collection. As always, try it for yourself and see what you think. We all have different tastes in games and you may not care for this one at all. Thanks for the reviews. Play on! Rated 3 out of 5 by crusades from WHOOOAAA WAY WAY too much blue and purple, way way too much visually in each scene... it was exhausting, and way way too much cinematic for my computer to cope with... I am exhausted after 5 minutes... No way for me.. Rated 3 out of 5 by Innisfree from Authenticity? I play these games for the stories and graphics. This game scores on both points. I really get annoyed about the lack of authenticity in games. Most games have a few offences, but this game has them in spades. It is supposed to be set in England' the policeman is uniformed in the English manner, other characters, both alive and dead, are English yet all speak with American accents. At least the police car is right-hand drive but the ambulance displayed signs that are foreign to British ambulance. And all that is in just the first 45 minutes. I will continue to play this game because it is otherwise enjoyable. So please take this review as a plea to all games producers to check, and double check, authenticity especially in real-world games. Rated 3 out of 5 by nadaze2da from Began with a lot of promise This game began with so much promise and quickly devolved into the usual games we have been served up lately. Four stars to the over the top story but fun factor was nil the further into the game you go. Fundamentally, its the usual story of an evil entity gaining more power and threatening to destroy the detective while doing it. I completed 4 Chapters before becoming so bored with the tedium of finding the usual things that I couldn't go any further. Drawers don't open without keys, amulets, hooks or whatever. At least I didn't find a missing zipper pull yet and I haven't put together a fishing rod. However, I have to look for the usual cans of fuel for the chainsaw and other items. I don't mind puzzles within an HOP because it tends to make it a bit more challenging. There is more than the usual back and forth through garishly purple and blue rooms to find items. Keep the jump map handy. Its absolutely boring to switch from room to room to pick up one thing and return to the previous location or another location to use it. The collectibles were few. Those little bugs that are supposed to light up when a collectible is in the room were not very helpful. At the point at which I stopped, the game had deteriorated to the point that I couldn't take doing the same ole things again. Maybe I'll return to this game one day to try it again, right now, I'm sending it to never land. Of course, try the demo. Rated 3 out of 5 by Majestyx12 from Too many puzzles, Don't want them in the Hops Based on the Finished Game with bonus material. I liked the Frankenstein in the game and thought we would have plenty of creatures but after Chapter 4 ( out of 8). I thought the story suffered and I was bored. It just got to be, put this here and that there. Liked the collectibles. Collect 56 movie tickets to out fit your movie room. Collect 11 posters. Collect 15 movie items. I hate puzzles in the Hops. Isn't there enough puzzles? Way too many puzzles. Liked some but skipped most. I won't be replaying the mini-games but there are 18. The hops that don't have puzzles I may replay altogether there are 19 hops. 15 Videos. Rated 3 out of 5 by cathybobcat from STARTED OUT GREAT......THEN WENT DOWNHILL FAST What started out to be an exciting and enjoyable game soon turned into an entirely different atmosphere with monotonous and boring activity that was disjointed to the storyline. Your collectibles are not very impressive in quantity. They are not in every scene. In fact, they were not in nearly enough scenes. There are 11 movie posters that are very creative....but there needed to be more of them. Why? Because you then only collect 15 Cinema Artifacts, as well as 56 movie tickets, so that you can buy things for your Auditorium Hall, which isn't a real big deal. There are moths that are on the top of your inventory and they glow when you need to find these collectibles. The problem is, the collectibles are so few and far in between...even for those 56 movie tickets. You don't see glowing moths as expected. This is a CE and I am used to having more to look for in scenes. I am not a fan of morphing objects, but this game certainly needed them. It was a real let down. You can replay 19 HOS and 18 Puzzles. Here's a kicker....There are so many puzzles in this game that I would not have bought it had I known. Sometimes they are one right after another. The demo sure wasn't like this. Everything was well balanced in the demo.....not so, later on. You are only going to be able to replay the puzzles they give you....and the number 18 is miniscule compared to what you will encounter in the entire game. HOS were nicely done, artistically, and were interactive, sometimes a puzzle in them (you can skip). There is also an alternative Match 3. One thing I did not like about the HOS is that there are too many story types. I don't care for them at all, even if these were done well. They are a waste of time and instead of listening to the story, I find myself looking for the irritating items. This is a long game....8 chapters. I am only on Chapter 6 and had to take a break because of all the going back and forth....and PUZZLES. I looked at this info in the SG. The BC also seems to be a decent length.....loaded with more puzzles. The SG is right beneath where you can view your posters on the lower left and they were too close together. I kept accessing the posters instead of the SG, which was annoying. Another issue to be taken into consideration is making the screen scenes bigger in the SG. They are incredibly small.....and there is enough space where they could enlarge them. It is difficult to view them properly. There needs to be a zoom feature...or something to lessen eye strain. The hint is helpful and transports. I found the map to be confusing at times, as well as some of the puzzle instructions. Even though I have just finished 5 Chapters, I do not know that I will finish the entire game. They lured me in with a fantastic demo....then it was a whole different experience after that...and not a pleasant one. I feel the saying is true, "You win some and you lose some." This is not a game I will be playing again. Rated 3 out of 5 by Pilot1 from How to take a psychedelic trip without chemicals! This could have been a great game, but I guess the graphic designer was having a really bad day. I found the story line, HO sequences, and mini-games, while all being somewhat familiar to any experienced gamer, and for as long as I could manage to play, just enough off-center to make them interesting. But, oh, those graphics! Let me see, what’s the word I’m looking for? Wait, I’ve got it . . . garish! I’ll save you the trouble of looking for that word’s definition: loud, tasteless, gaudy, kitschy! Get my point? I really wanted to play this demo, but oh those colors! About five or six minutes is all that my poor eyes could stand! If you’re old enough to know what ‘tripping’ means, you may just be able to play this game without losing your mind, but you'll still risk getting a severe case of eye-strain. If you’ve got a lot of download capacity, and some aspirin nearby, go ahead, try the demo. Rated 3 out of 5 by twinsoniclab from Demo was okay, nothing caught my interest though Something was lacking in the demo. I just didn't get that "I gotta play more to find out what happens next" feeling that some games give me. I felt I kept playing just to play enough to give a fair review of the demo. Not a great way to feel about a game that, really, there is nothing wrong with! Well, it's too purple! What's with developers making games so purple? Is purple cheaper to program!? Choose male or female character. I object! The female is "clever" and "perceives supernatural" stuff. But, the male character gets to be "brave" and he's already known for "saving many lives!" I want to be a brave woman! HOS: a variety. The first was best, it introduces us to the phone with a list. When objects are found, we learn about the characters and setting. Then some silhouettes and story (find the items shown as words - not my favorite). Some HOS include mini-puzzles. Some are introduced with a puzzle. One was find so many ofs, then interactive items where we learn the just WHY the director is doing what he's doing! Nice to know! You can play Match-3 instead, but it isn't a very good version. PUZZLES: Would be easy if some of the instructions were better. Or else it's me. Enter "code" which is just four symbols on a paper. Sort of a maze, collect helpful items to progress. Press buttons to make a pattern (on easy you may as well skip, it's meaningless to play). Match radio waves (once). Piece a note together, the place chips like it shows on note. Too many torn pages to put together. COLLECTIBLES: Lots, which may be the saving grace for me and this game as a CE. I don't think I'd bother with it otherwise, but collectibles are why I buy CEs. Not the bonus chapter and definitely not the other stuff always offered in the extras! * Cinema "attributes" - 15 * tickets - 56 - use to get things for the audience hall. Like seats, lights, popcorn machine... * posters - forgot how many! * not really counted as collectibles, I don't think, we do get "notes" that go into our "task" book. We do get the same sort of tasks and inventory. A rusty lock. A sewn up curtain. A lock pick that once again isn't used for a puzzle (they used to be). A bit too much help in the inventory (like the laser pointer... surely we'd figure out to play with the cat? Do we have to see the image is a mouse?) and via ringing phone. Now and again we get a ring and learn what we are supposed to look for, what we will need (glass cleaner), or how to do things (what will open that rusty lock). No need for the extra help, if we want it we'll ask! If the missing sister is a member of the British Association of Architects, and we drove a car with a right-hand steering wheel, why don't any of the characters sound British? Let's take care of the little things, developers! Players notice! Oh, the GM crashed and the game closed right after I used the glove on the statue, and again when I exited the game. My game was saved, but still... something isn't quite right with it! I will give an unenthusiastic recommendation. As a CE, and with a very good sale, I'll get it. But, I was not overly impressed by any part of the game. Rated 2 out of 5 by LunaNik from Why are all developers releasing the exact same game? There's nothing new here. In 15 minutes, I had a long list of shaped keys to find. Each scene was chaotic, with random items scattered about. Naturally, each one needed a tool, part, or shaped key. No thanks. I already have hundreds of games just like this one. The palette will blind you, especially since there's a bright flash over your entire screen every time something changes. And cutscene animation is blurry and pixellated. I actually started to get headache. Lastly, Domini did everything possible to destroy immersion, including banners every time you moved, notifications of dubious achievements, and loads of unnecessary, lengthy animations. And my hand was held firmly throughout. Why can't you just leave me alone and let me play the game? I'm not five; I don't need a babysitter. Rated 2 out of 5 by MissAbby from Tangled Up in Blue..and Purple..Again Way too Blue and Purple...again. There are other colors in the palette, why they continue to use blue and purple is a mystery to me. Same puzzles and actions as most of the other games these days. Pick up and place something totally unrelated to open a drawer, a box, a book..and find odd objects that do normal things such as open a door with a toaster instead of a key. (I made that one up, but it's not that different in the CEs these days). It's just silly stuff which is annoying and not even remotely funny or fun for that matter. Feels like it's just a time filler to make the game last longer. I found this game tiresome and repetitive. It gave me the blues...and the purples as well.